A graduate of the Institut de Tourisme et d’hôtellerie du Québec , Timothée Vielajus distinguishes himself by a rich career for his young age. An autodidact when he arrived in Montreal 6 years ago, he learned the rudiments of gastronomy at restaurant Les Trois Petits Bouchons , and became a cook at Fillettes. 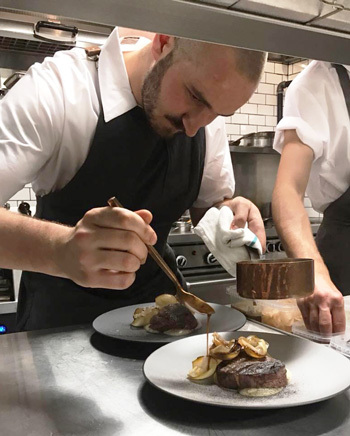 He began his training a the ITHQ while working simultaneously in the kitchens at La Salle à manger, Candide and the French Michelin-starred Le Fanal abefore becoming sous-chef at Chez l’épicier in 2018.